Welcome, friends – I’m Annie! 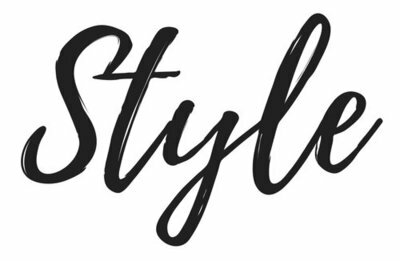 The Style With Intention podcast is my passion project – it’s where I get to do everything I love at once! I know many of us are at a restless point in our lives. Maybe you’re changing jobs or going back to work. Maybe you feel like it’s finally time to do the things you’ve been putting off. Or just rest. Maybe your life has been steady and predictable – and you’re starting to wonder…what’s next? Wherever you are in your life, I wonder if you’re looking for the same things I am…a little more peace, some room to relax and just think, an idea of what my nest chapter will be. You know, just “happy” with life. Feeling more happiness is the motivation for most of the things we do in our lives. Even the hard things. Consciously or subconsciously, we always choose what we think will bring us more happiness. I believe personal style is a tool we can use to create the experiences we want to have in our lives. Here’s what I mean…your personal style is the sum of all the simple, small choices you make everyday. They all add up to how you feel inside and end up showing on the outside – in your look, your spaces, and your interactions. Small choices that make a big impact – this is the power of having Style With Intention. Everyone wanted to experience something better. New clothes, a new room, a new perspective that feels “right” can change your whole life – but this isn’t about spending a lot of money or impressing other people. Most of my clients are intelligent, thoughtful people – and they are big thinkers. They want to understand themselves. Sometimes, we realize that the way we are living – our clothes, our homes, our style, and all of the externals – haven’t kept up with how we want to feel inside. I love helping people feel happy, from the inside out. My work is all about finding the tools that will help you feel more aligned with what you’re longing for – whether it’s more ease, more joy, or more intention in your life. When we reach for the feeling first, and then make personal style choices to support that feeling, we can get there faster and with a lot less effort. This is a whole new way of thinking about personal style and design. The Style With Intention podcast is about creating the life you want to live – with style. My passion lies at the intersection of personal style and personal development. This is what gets me up in the morning and makes me lose track of time everyday! I’m on a quest to understand how our emotions control the quality of our lives – and how the style choices we make can affect our emotions. Emotions are very powerful – but they aren’t facts. Our feelings create our thoughts, and our thoughts dictate our choices. So, if we can manage our feelings, we have the power to make our lives more the way we want them to be. The Style With Intention podcast is a place where we can explore this. 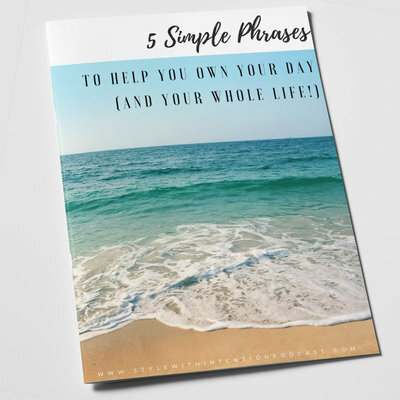 I want to share my life and what I’ve learned, so you can create your own version of a perfectly imperfect life – filled with moments of connecting with the important people in your life, feelings of easy confidence, uplifting days, relaxation and ease, inspired work, and excitement about whatever’s next for you. You can create a life you love. Please reach out to me anytime you have a thought that might help me understand how to serve you better. I’d really like to hear from you! I’m wishing you days filled with ease, joy, and intention.